Looks like we might be stumbling again into one of those situations Yogi Berra described as deja vu all over again. Tobias Adrian, Fabio Natalucci, and Thomas Piontek in the IMFBlog sounded the alarm on burgeoning risks in the $1.3 trillion leveraged loan market last week on the very same day that Senator Elizabeth Warren raised similar concerns when she grilled the Fed’s vice chairman for supervision, Randal Quarles, during hearings before the Senate Banking Committee. Quarles said the volume of the loans isn’t as relevant as “the structures that these loans are being held in,” and the central bank is “looking very closely” at the matter. But he resisted Warren’s suggestion that the Fed should come down harder on those making the loans, as they did as recently as five years ago. “It’s not a rule,” he said. “To enforce guidance is inappropriate.” Instead, he said, the Fed is holding banks “to standards of safety and soundness.”[emphasis in original]. This strikes me as precisely the sort of obfuscatory gobbledegook that should make us sit up and realize, aha! There’s a real problem here. The day before the hearing, Warren outlined her concerns more completely in a letter to Treasury Secretary Steven Mnuchin; Comptroller of the Currency Joseph Otting; Fed Chairman Jerome Powell, Securities and Exchange Commission Chairman Jay Clayton and FDIC Chair Jelena McWilliams. The letter is dense and thorough, and focuses on regulatory concerns, with specific questions to each addressee, and I encourage those interested to read that letter in full. But my concern in this post is not regulation per se, so I shall not discuss that letter further at this time. There was a risk lessons from the crash were being forgotten, as banks embark on an aggressive lobbying push to water down reforms that were put in place at the start of the decade, Ms Yellen told the FT.
Ms Yellen said that while regulators were insisting banks hold appropriate capital against leveraged loans on their balance sheet, much of the debt ended up getting repackaged and sold on elsewhere. The content, tone, and intensity of these comments, from different but impeccable sources, should have grabbed your attention – although the concerns may seem a bit abstract. The short IMFBlog piece, lays the problem out starkly and succinctly, and in the remainder of this post, I’ll focus on the five issues highlighted there. It also included some excellent charts that present the information clearly for those who prefer to absorb information in that manner. So, without further ado, what are the specific concerns the IMF has identified with respect to leveraged loans? To begin at the beginning, in an era of easy credit, speculative-grade companies have not resisted ample opportunities to gorge themselves on cheap debt. The result: globally, in 2017 new leveraged loan issuance reached a record $788 billion, thus edging out the pre-crisis high of $762 billion in 2007. The US accounted for more than 70% of this market, with $564 billion of new loans. Figures for 2018 are not yet complete, but it looks like they won’t be far off the 2017 mark, having already reached a $745 billion annual rate. 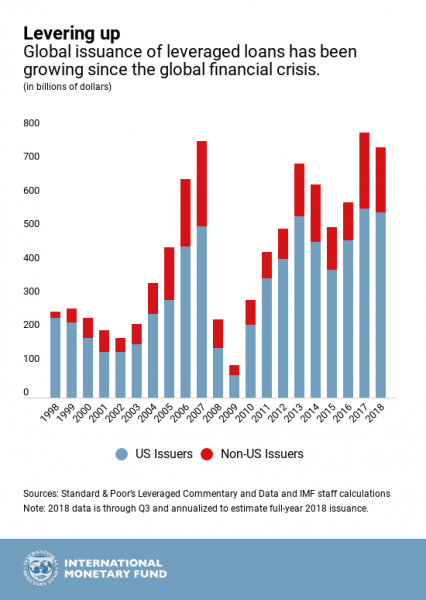 Far from being directed into productive investment – the stated rationale for the past decade of low interest rates — the IMF instead notes that more than half the total of leveraged loans issued this year has been used to finance mergers & acquisitions activity, leveraged buyouts (LBOs), or share buybacks (aka financial legerdemain, or parasitic finance), and pay dividends. How vulnerable is the leveraged-loan market to a sudden shift in investor risk appetite? If this market froze, what would be the economic impact? In a worst-cast scenario, could a breakdown threaten financial stability? As I outlined above, some regulators — as well as investors – are acutely aware of such concerns. 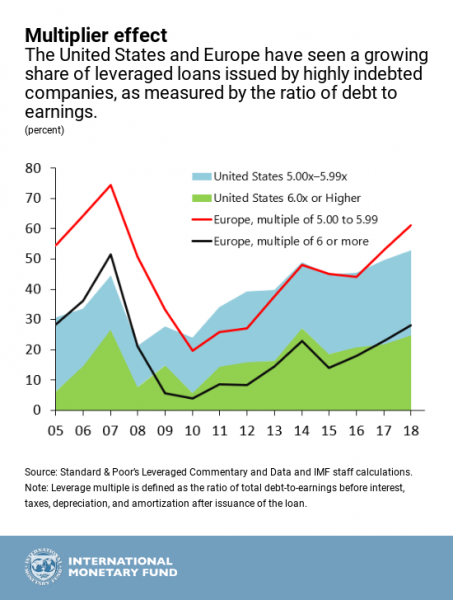 As figure 2 illustrates, in both the US and Europe, a growing share of leveraged loans have been issued by highly indebted companies. Echoing concerns expressed by Warren, Yellen, and the private sector, it’s not only the skyrocketing growth of leveraged lending in aggregate that is ringing warning bells. But who is doing the borrowing — especially their existing indebtedness — is itself its own problem. In both the US and Europe, the share of loans issued by highly indebted companies (as measured by the ratio or debt to earnings), has steadily increased. How is the possible? Again, echoing the concerns expressed by some regulators and investors above, in order for this party to continue and indeed expand down the block, it has been necessary for underwriting standards and credit quality to deteriorate, as evidenced by the decrease in covenants to protect investors, and lower loss-absorption capacity. I was amazed to see the degree to which this has occurred. I mean, I’ve been aware of this problem in general, but until I saw this IMFBlog piece, I hadn’t focused fully on the degree. This year, so-called covenant-lite loans account for up 80 percent of new loans arranged for nonbank lenders (so-called “institutional investors”), up from about 30 percent in 2007. Not only the number, but also the quality of covenants has deteriorated. The -ahem- healthy appetite of investors for these leveraged loan deals has also led to a relaxation of non-price terms. 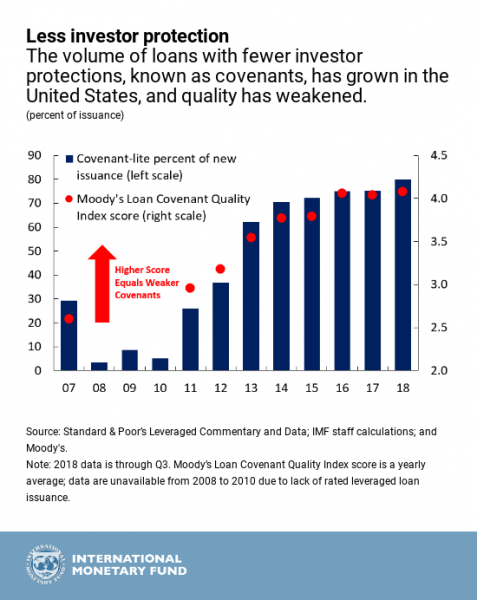 This is another consequence of the weakening of covenants – absent such standard investor protection terms, borrowers have greater latitude to manipulate their earnings projections – and investors have not reined them in. Why does that matter? Well, fiddling with earnings projections allows borrowers to take on more debt. 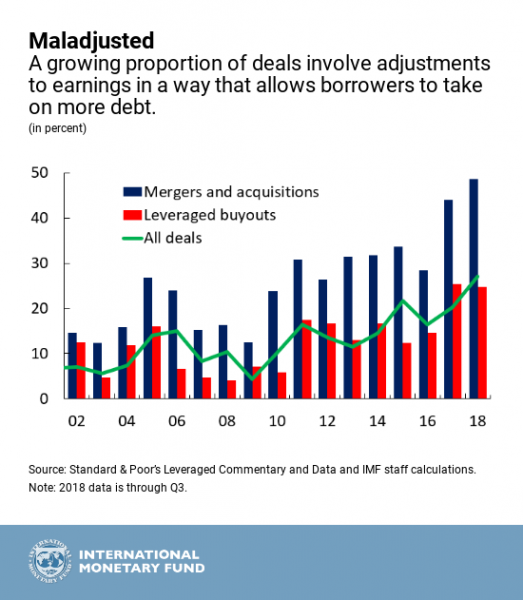 And one other thing they’re allowed to do is borrow after deals have closed – thus further increasing their indebtedness (and increasing the amount of leveraged loans outstanding, see my first point above). Jerri-Lynn here: Does this seem sensible? Or does it more resemble a Wayne’s World approach to debt issuance. Party On! average recovery rates for defaulted loans have fallen to 69 percent from the pre-crisis average of 82 percent. A sharp rise in defaults could have a large negative impact on the real economy given the importance of leveraged loans as a source of corporate funding. Those who are more graphically inclined might find Figure 4 helpful. Fifth, Who Holds These Loans? Just in case the proceeding four concerns aren’t cause enough for worry, the fifth point the IMF makes may be the most serious: who holds these leveraged loans? Answer: institutions now hold $1.1. trillion worth of these loans. That compares to the roughly $1.2 trillion in high yield debt aka junk bonds outstanding. Mutual funds hold about $200 billion in leveraged loans – roughly 20% of what’s outstanding, up from $20 billion in such holdings in 2006. Other institutions who hold such loans include insurers and pension funds. 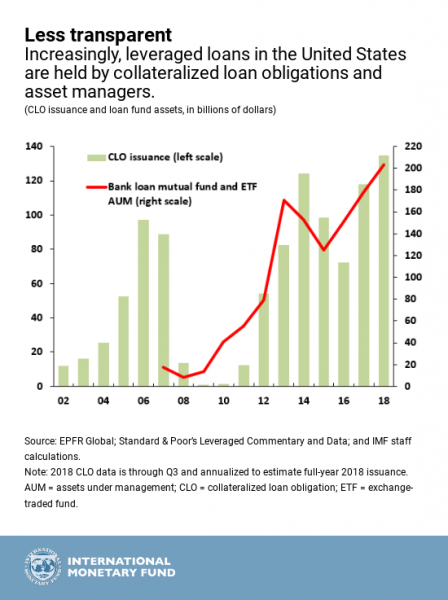 But here’s where you should pay closest attention: at present, half of all leveraged loans issued in the United States are purchased by collateralized loan obligations (CLOs), which bundle them and then resell them to other investors. Again, for those who prefer their data in graphic form, see figure 5. Hence the tone and content of remarks by the likes of Warren, Yellen, the Bank of England, and I’m sure many others, about the risks of the current state of play of leveraged lending. Would be useful to see a list of the biggest borrowers at risk. I suppose this means the ‘job creators’ will be pan handling for bailouts again. This time let’s just let the house of cards fall and see if the world ends. After all, that’s what they said would happen if taxpayers didn’t bail them out the last time. yeah those on the top didn’t care about us on the bottom last time, so we shouldn’t concern ourselves with their troubles next time. Unfortunately the PTB seem pretty good at dumping it all on someone else, so really the question is how will people react to the sham. This and the other post on the IMF rearing it’s very concerned head are a sign that the screws are tightening and the aforementioned PTB are already setting up some fall guys. Imagine the internationalist/globalist cabals response to AMLO scratching the airport, a hub for getting latin goods into the US in as friction free manner as possible, and likely with all variety of sniffers and groovy tech and all that goes with it. Last time I remember many people I talked with, particularly liberals, mentioning the USA would enter a new Great Depression if we did not rescue the banks. I pointed out that the government could nationalize the banks and keep the economy running as deposit insurance protected small depositors and that wasn’t there in the Great Depression. I would tell them the USA had finally recognized that it had made some overpriced investments in real estate and had a massive loss to recognize, I suggested TPTB were looking to push that loss onto someone. I suspect the same “fear of a Great Depression” will be stoked again to get the population behind another financial institutions bailout. The elite may be quite happy with this turn of events, borrowed money pushes up stock prices that the elite capture by selling stock, then the loan used to purchase the stock is defaulted on, damaging financial institutions that MUST be rescued by the general populace. The powerful may view at this as entirely appropriate..
It’s quite logical: buying the banks’ failed bets is periodically necessary to sustain a free market and preserve the independence of the Federal (sic) Reserve. What a strange kind of Jubilee that is. No surprise that it works only for the Looters. Guessing that hi yield debt should be $1.2 trillion. Is there a “median” loan size? Is GE an example? Other American icons in various parts of the US locals might recognize? Glad to see the discussion in public at least? It’s the people who just about make do, are being careful and not spending more than their income who suffer. We never got rid of the people responsible for the GFC and they are back at it. What do you expect? Bingo. Almost as if it was planned, huh? This is the First Commandment of “free”-market capitalism. Thou shalt not regulate. There are no other laws before this law and no other gods before the market. Isn’t the Federal (sic) Cartel wholly owned by and thus explicitly captive to the banks it is purported to regulate? What does Warren’s sound and fury hope to accomplish, a soundbite for 2020? Our economic system is a perversion, Yet many still believe it is something called “Free-market Capitalism”, a system that theoretically requires enforceable rules to maintain energy and balance and life. Whatever we have now is a different system entirely, hiding behind a free-market facade. But what can we call it? As Dr Michael Hudson’s new book reveals, concentration of wealth and power and increasing inequality are NOT side-effects of this system. They are the prescribed purpose — absolute dominion. Control of the money supply, the executive, legislatuve, judiciary, military … Global full-spectrum dominance. We have to grasp this criminal insanity, because some of our most earnest discussions are premised on the idea that logical appeals to reason, justice, fairness, efficiency and the overall wellbeing of humanity might sway the powers-that-be to repair systemic structural flaws in our economy before further instability leads to collapse. But these so-called flaws have been blindly obvious for decades. So guess what? They. Do. Not. Care! They are sociopaths, perhaps delusional sociopaths too power-addled to foresee systemic collapse or worse intend it as game-changing strategy. The Federal Reserve is an independent agency of the United States government. Its Board of Governors is nominated by the President and approved by the Senate. Member banks are allowed (in fact required) to own *non-controlling* stock in the regional Federal Reserve Banks that nets them a static 6% interest rate. They can’t sell this stock, and it gives them no say in policy making. That is the extent of ‘private ownership’. New money is created when Congress legislates it into existence, at which point the Treasury tells the Fed to add the needed money to Treasury accounts. Any profit generated by the Fed, that isn’t used to pay for operations, is handed over to the Treasury at the end of every year. You can’t make meaningful, valid criticism of something when you don’t even understand the basics of it, which you very clearly don’t. Congrats. You’ve read the Cartel’s website and Wikipedia blurb so now you understand the basics enough to rain scorn upon the naive. Member banks own the stock but not the bank or control thereof? Got it. That my learned friend is effective camouflage for gullible people who prefer not to see the wires behind the stage rigging or whose salaries depend on their not seeing the blatant self-dealing behind the free-market facade. I suppose you also believe the cartel is not feeding info to its PDs and its PPT is not buying equities during air pockets. Because Fed stock doesn’t work like corporate stock. No, it’s created by decree of Congress. I think you might want to read, William Greider’s ‘Who will tell the people’ and also ‘The Creature from Jekyll Island’. The structure of the Fed was poisoned from the beginning. It is an ‘independent’ institution but it is precisely this independence that causes its whoredom to Wall Street. There is free movement from Wall Street to the Fed and back again. The Fed does not listen to any quarter except Wall Street when it sets policy. The Creature from Jekyll Island is garbage. The meeting on Jekyll Island in fact did take place, and produced what was called the Aldrich Plan. This plan died in Congress. Twice. The Federal Reserve Act that actually did become law wasn’t this plan. In fact the FRA was specifically designed to fix the flaws in the Aldrich Plan, which actually was about setting up a private banking cartel. Yes, the revolving door most definitely exists. That doesn’t change the fact that the Fed can only create money by working with the Treasury on the order of Congress. Please stop this Fed conspiracy theory nonsense. I’ve read Grieder and you are misprepresenting him. The Federal Reserve System is not controlled by member banks. Volcker never would have been able to raise short term rates to the moon if they were, for starters. The Fed is cognitively captured. It is full of monetary economists, which means they think like Chicago School types. That is more than enough to produce the results you see. Exploring how the Fed regulates the global economy and handles its own internal politics, and how the law does―and does not―define the Fed’s power, Conti-Brown captures and clarifies the central bank’s defining complexities. He examines the foundations of the Federal Reserve Act of 1913, which established a system of central banks, and the ways that subsequent generations have redefined the organization. Challenging the notion that the Fed Chair controls the organization as an all-powerful technocrat, he explains how institutions and individuals―within and outside of government―shape Fed policy. Conti-Brown demonstrates that the evolving mission of the Fed―including systemic risk regulation, wider bank supervision, and as a guardian against inflation and deflation―requires a reevaluation of the very way the nation’s central bank is structured. Ellen Brown: Who Owns the Federal Reserve? The Fed’s website insists that it is not a private corporation, is not operated for profit, and is not funded by Congress. But is that true? The Federal Reserve was set up in 1913 as a “lender of last resort” to backstop bank runs, following a particularly bad bank panic in 1907. The Fed’s mandate was then and continues to be to keep the private banking system intact; and that means keeping intact the system’s most valuable asset, a monopoly on creating the national money supply. Except for coins, every dollar in circulation is now created privately as a debt to the Federal Reserve or the banking system it heads.4 The Fed’s website attempts to gloss over its role as chief defender and protector of this private banking club, but let’s take a closer look. Ellen Brown is not a credible source on most things related to banking. What she describes is what a central bank does, act as a bankers’ bank. No central bank backstopping the banking system means we’d have panics and bank failures all the time. She is wrong about 85% of the time and her work on the Fed is in that 85%. We don’t link to her as a result. > This is the First Commandment of “free”-market capitalism. Thou shalt not regulate. Agree. When Goldman Sachs was choking itself to death in 08 it should have been allowed to die. Instead the regulators turned it into a bank holding company in 30 seconds and gave it mouth to mouth resuscitation. It is socialism for Goldman, capitalism for peasants. You may be interested in this essay, which gives a pretty good explanation of the little known actual ownership of the Fed. It looks to me like it is the case that U.S. banks do control the Fed. They appoint two thirds of the governors. First, by appointing directly one third; secondly by appointing the “outside” electors who appoint another third. And since they have such strong influence over the congresscritters who appoint the remaining third they virtually appoint all the governors. There are many differences of opinion among the governors, of course. Some are conservative, while others are very conservative, and some are downright reactionary. …did you actually read it? More LBO and M&A looting by financiers, financed by CDO’s dumped on “the dumb money” savers chasing returns. These covenant-lite loans can’t ever be repaid and must eventually default. The question remaining is who is buying the CDO’s, and what recourse will they have? Thanks for this thoughtful piece. It’s as if the GFC never happened — Moral Hazard in action! To David and also Doug above. You are exactly right. Each of these activities is specifically designed to allow management to loot the company. That it is occurring at companies at the bottom of the pile, in addition to those at the top ( Apple, etc, as has been discussed in previous posts) just demonstrates the extent to which corporations have been turned into instruments of wealth extraction and concentration by management. Well, loaning money to firms that are towards the insolvent end of the spectrum in order to buy back stock and pay dividends sounds like quite the virtuous cycle to me. Something about “Loans that cannot be repaid will not be repaid” hovers in the background. The Borrowers are somewhat easy to identify. Who are the lenders, that is the people holding the “notes”? The owners of the CLOs? Insurance companies and pension funds? agency or, if unrated, that the Fund’s advisor determines to be of comparable quality. The Fund may invest up to 10% of its total assets in below-investment-grade bonds. currencies other than the U.S. dollar. It should be noted that the average rating of Baa3 is one grade above junk, so that this new fund will be holding a lot of junk. It will also be actively managed with the belief that they will be able to swap away their troubles until the counterparty risk and liquidity problems arise if the system collapses. After reading these two IMF articles it seems that they are there only to make the world safe for investors. Very neoliberal from the getgo. I’m shocked to realize how powerful they are, even when they haven’t loaned out any money, simply because the US dollar is so strong – and the IMF R US. Mexico should have every right to develop its own refineries. But clearly it will be big brother who gets to do that. Commodities are all that count. So it is a very scary disconnect when even commodities count for nothing. Then the money starts flowing through the banking system with the blessing of the Fed and the IMF and the ECB and etc. to the point of no return because they don’t know what else to do. It’s irrational capitalism at its finest. When corporate bonds which have been re-upped and recollateralized to worthlessness come due this time we can only hope it is the Fed, IMF, ECB, etc. who are decommissioned in favor of spending which always maintains its value – social spending. Then maybe CalPERS will see the light and design a retirement fund loan corporation. Who needs idiots like the IMF? The bankers have had a field day shifting their debt products to maximise profit in the last forty years. There was nothing to hold them back as no one was aware of the problems. The mainstream neoclassical economists don’t consider debt, and a belief that banks were financial intermediaries made everything seem OK.
Debt was the answer to every problem and the world gradually filled up on the stuff until we reached near saturation today. The developed world loaded up on debt before 2008 and the emerging markets, including China, after 2008. All we have been doing is moving future prosperity into today with debt. We enjoyed the good times with money borrowed from an impoverished future and that impoverished future will very soon be here. The precedent was set in 2008. Why in the world WOULDN’T financials drive full-speed off the next cliff? I am not at all surprised that profit hungry banks and their self-interested employees would be willing to take absurd risks for one more night at the casino. What I do find interesting is a junior senator pulling the covers back for all to see. I suspect that it isn’t just Senator Warren burning the midnight oil and ferreting out such lax or lack of regulation. I suspect the lady has a top-notch staff. It has become apparent that while such excessive risk-taking is ill-advised, it is not illegal (or at least no one has the courage to prosecute), so only aggressive regulation will prevent it. Kudos to Senator Warren and her hard working staff.